Indian Food Rocks: Happy Diwali! Today is Dhanatroyadashi, the first day of Diwali. Tradition held that it was the day to buy gold. My family never did. 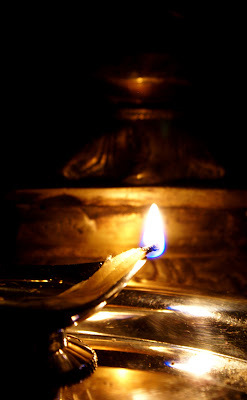 What we did do was put a diya on our doorstep and switch on every lightbulb in the house. And we continue with that tradition except that we turn on the lights in a very symbolic fashion - they are turned off soon thereafter. This year Diwali is going to be very lean. One namkeen and one sweet only. The two people that were polled, voted for kaccha chivda and chavde. I feel like making sanzhori, too. For me; and in memory of my Dad. A very Happy Diwali to you and your families! Manisha...A Happy deepavali to you too..Medha's diya looks beautiful..convey my wishes to her!.. looking fwd to the dishes you made on the festival! Diwali wishes to you and yours too, my friend. Happy Diwali to you Manisha! May the next year bring you much happiness, success, and prosperity! Happy Diwali to you guys too Manisha! May this year bring you lots of joy and prosperity. Happy Diwali to you and yours Manisha! Happy diwali to you n your family as well!! Find out the most vibrant, exquisite and redeemed wallpapers for Diwali celebration. Manisha, my sweetest! I really wish you and your clan a Happy Diwali! Love the shots. Hugs always! Manisha, happy Deepavali to you and yours! May light always triumph over evil, may happiness brighten your heart and hearth - forever and a day. 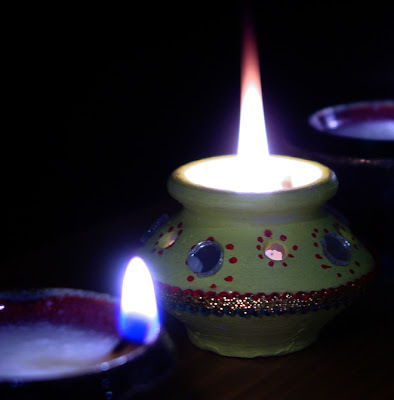 Manisha, a very happy Diwali to you and your dear ones..and Medha's diya looks so pretty. That is such a beautiful tradition and Medha, the diya is just gorgeous! May the new year bring you one step closer to all your dreams. Thanks for the sweet comment you left on my blog. happy diwali to you, medha and d.
Happy Diwali to you too dear. Hope you had a nice day.